If ever you need a little something to tie you over until your next meal, I have the perfect solution! 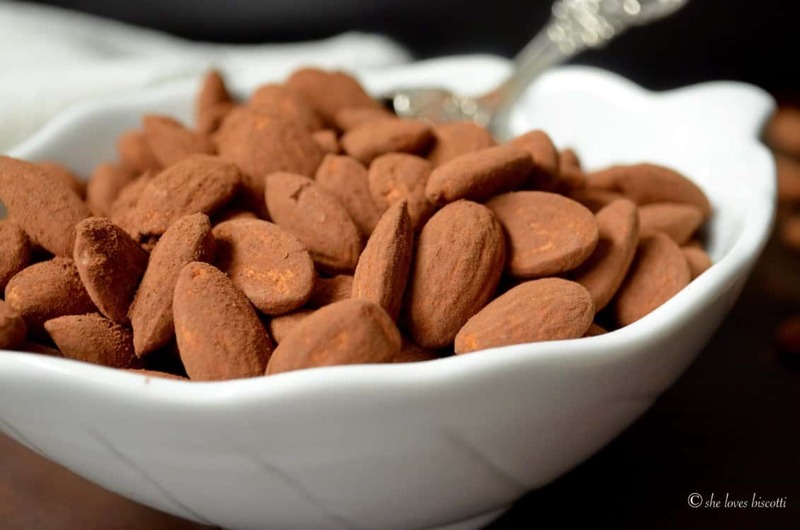 These 5 minute Cocoa Dusted Almonds will quickly become your go-to snack. You won’t believe how convenient and easy it is to prepare this healthy snack! The FIRST minute: Sift together cocoa powder, cinnamon, and salt in a medium bowl. Set aside. 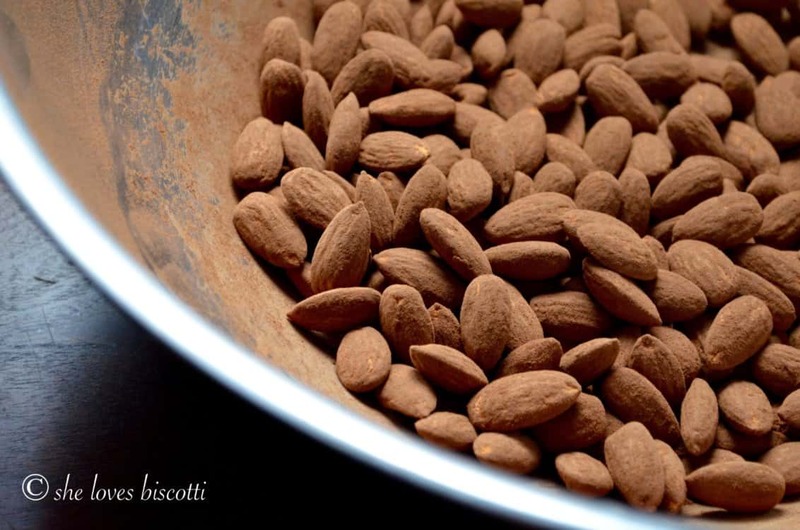 The SECOND minute: Measure the almonds and place in a medium bowl. Set aside. The THIRD minute: Combine the honey and vanilla extract in a small saucepan and place over low heat. As the honey is heated, it becomes more “liquid”, and therefore it will be easier to coat the almonds with the mixture. The FOURTH minute: Remove the honey mixture from the heat and pour over the almonds. Quickly stir together and combine. 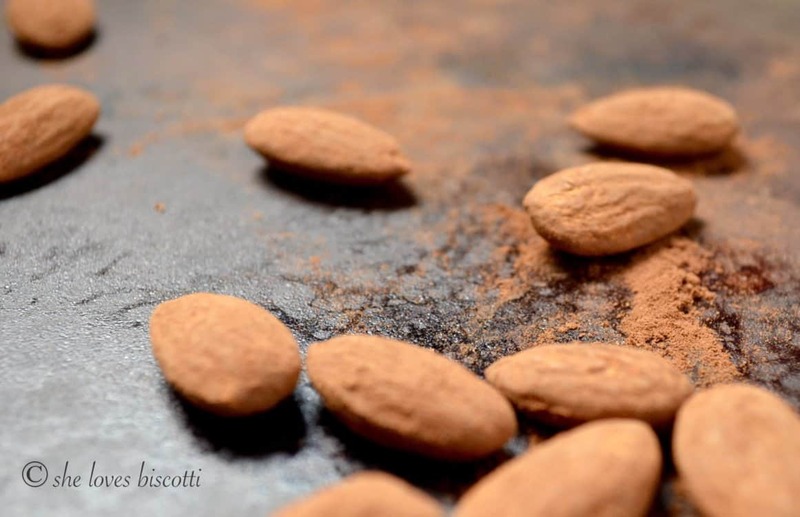 The FIFTH minute: Quickly combine the honey coated almonds with the cocoa powder mixture and toss gently together until the almonds are dusted with cocoa. Congratulations! You have just made your first batch of 5 minute Cocoa Dusted Almonds! 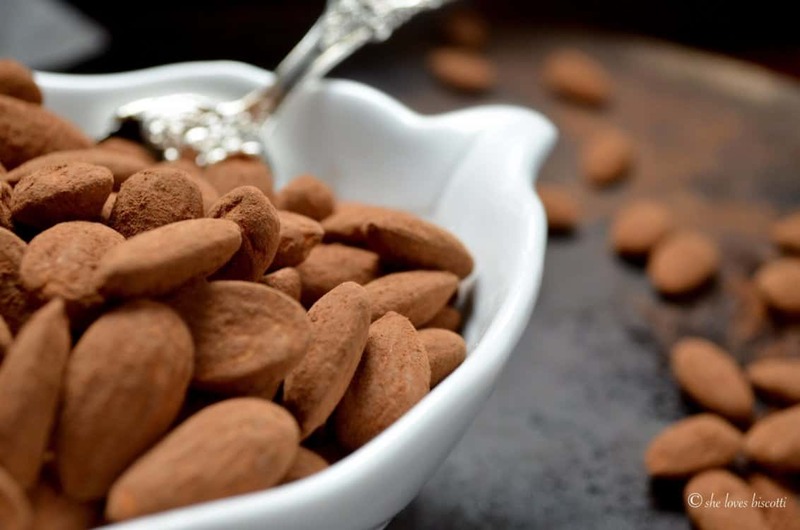 Almonds are also extremely versatile: you can eat them raw or roasted, glazed in chocolate or dusted with a little cocoa powder… etc.! Blendarize them to make a smooth homemade almond butter, which can then be spread over apple slices or celery sticks to make a healthy after-school snack for the kids when they come running through the door. Whether you are using them in baked goods, or to top off your savory dishes, they always provide the perfect finishing touch. Once you realize just how healthy almonds (and cocoa) are, you will find so many ways to incorporate them in your daily eats ! 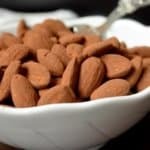 Just recently, my husband returned from Costco with commercially packaged almonds dusted with cocoa powder (did I mention almonds are one of my obsessions?). I immediately thought to myself that a homemade version of that snack would be so much better. The inspiration for this recipe came from the California almonds website. If you are not familiar with this website, you should take a few minutes and take a peek at all the wonderful recipes they have. Not only are there great almond recipes available, but you will also find wonderful facts about almonds. For example, did you know that California produces 80 % of the world’s almonds? I think you’ll agree that that’s a lot of almonds! Everything you’ve ever wanted to know about almonds but were afraid to ask can be found at this website… just follow this link. 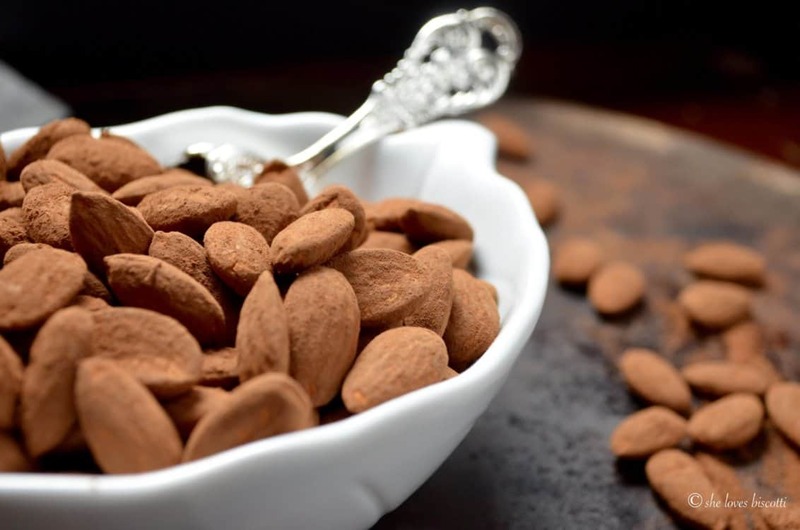 In a nutshell (sorry, I couldn’t resist 🙂 ) there are so many reasons to love almonds, and this recipe for these 5 minute Cocoa Dusted Almonds is just one of them! 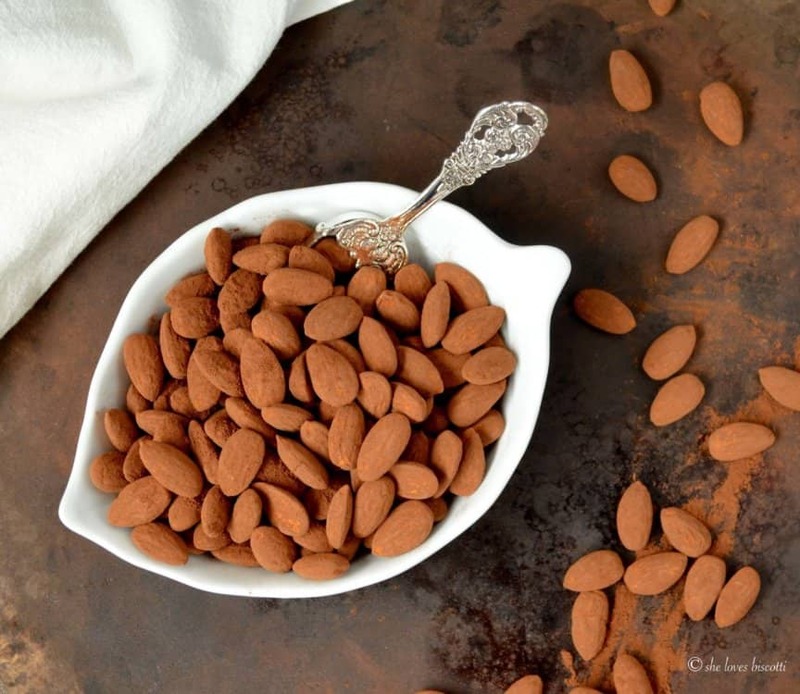 In a nutshell (sorry, I couldn't resist) there are so many reasons to love almonds and this recipe for these 5 minute Cocoa Dusted Almonds is a great one! Sift together cocoa powder, cinnamon, and salt in a medium bowl. Set aside. Measure the almonds and place in a medium bowl. Set aside. In a small saucepan, heat honey and vanilla extract over low heat. (Alternately, use microwave to liquefy the honey). Stir together. Once the honey mixture has "thinned" out, remove the honey mixture from the heat and pour over the almonds. Quickly stir together and combine. Quickly combine the honey coated almonds with the cocoa powder mixture and toss gently together until the almonds are dusted with cocoa. Can be stored in an airtight jar or container. Omg!!! These are delicious and perfect when dieting and just need a little something sweet to take the edge off. Perfect..
Made this for friends and it was an instant hit! Thanks Maria for such great recipes. What a great idea for a recipe and have all the ingredients in my pantry! Can’t wait to try this! hahaha! I bet it took me more than 5 minutes to read this post…I could have already done a batch of these tasty almonds. I have had cocoa dusted almonds before and they ARE so addictive. Your photos are very enticing in this post, I just want to reach in there and grab a handful! These almonds sound so good, and I love how easy they are to make! Sounds delicious, and so quick to make! These can be expensive to buy pre-made, so it’s nice to have a homemade version, which is much better anyway. Yum! There are genius! I love how they are a healthy snack high in antioxidants AND so easy. Yum! 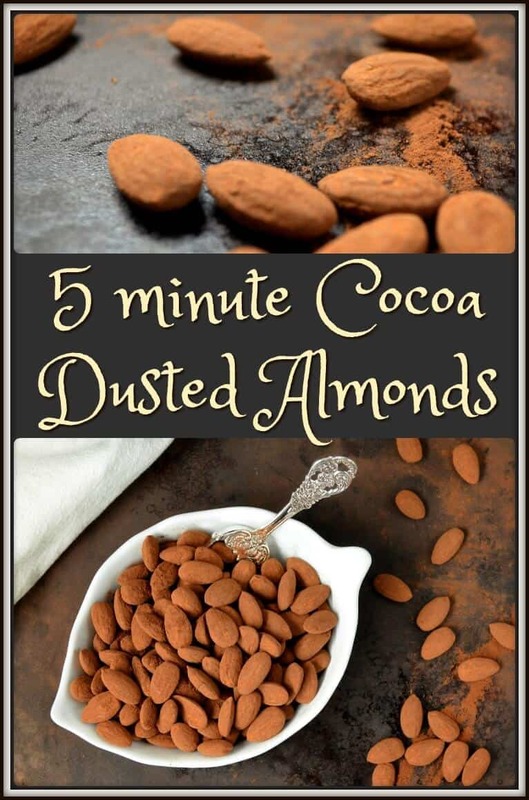 I absolutely love cocoa dusted almonds! I may or may not have eaten half a large container when I was first introduced to them! So tasty and so DANGEROUS! haha I WANT THOSE IN MY BELLY! OMG you had at 5 minutes then again at cocoa! I cannot believe how easy this is. We buy those big bags of almonds at Costco too 🙂 We usually just roast them, not anymore! We will definitely make these soon. Cannot wait! !